Monitoring the progress of the ongoing project is crucial for construction. Time lapse construction video is the effortless way to monitor the construction site. STUDIO 52 has been doing time lapse video production for clients now for over 40 years, in Dubai, Abu dabhi, Sharjah & rest of UAE. We are the most experienced, advanced & reliable. Even after all that, we remain one of the most commercially affordable. We have a team of expert timelapse video maker. We’ve encountered and tackled the issue that can come up – and we’ll either envision it in advance or explain it consistently without awakening you. We use advanced solar powered cameras. What if the feed line is broken? We use the latest wireless equipments. What if the cameras get repositioned? Our team monitors them 24/7. What if there’s too much footage? We have unlimited cloud storage. What if I need a progress report? We can deliver a professional, HD status report whenever you need one. 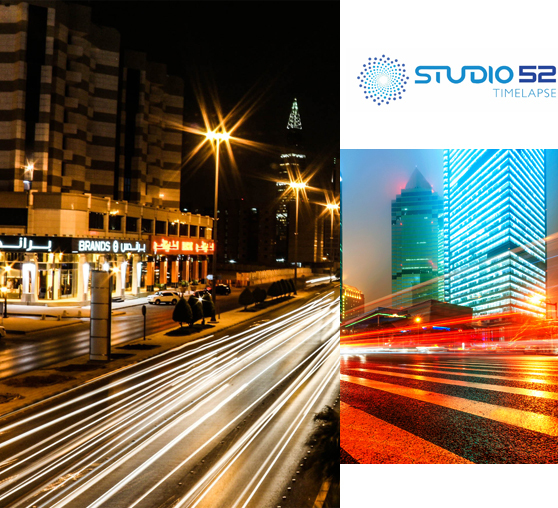 Studio 52 is a leading name in timelapse video production in Dubai, UAE. Our timelapse services include site survey, installing the right equipment, monitoring the set up for as long as necessary, compiling the progress reports on-time and then deliver the complete project in impressive HD quality. So, do what the savvy executives do. Go to sleep worry free! We avail quality construction timelapse videos production services across UAE, Kuwait, Saudi Arabia, Bahrain, Oman Qatar, and other middle east areas. We have delivered construction site time lapse camera for the industries such as Building, Oil & Gas, and Maritime. With time lapse camera system you can view months of construction in minutes. At Studio 52, we have designed time lapse camera for the construction project to capture and present the most dynamic views of your construction site in motion. Also, Time lapse construction cameras facilitate remote monitoring of the construction site progress from anywhere. Timelapse Drone Shot Video takes the progress presentation of your construction site to the next level. Our HD Drone time lapse video capture the best seamless projection of your work. We provide HD & Ultra HD Construction Timelapse videos for Short & Long Run Shoot with long time lapse camera. We haven’t forgotten the amazing job Studio52 did for Swissboring. In fact whenever we have an enquiry for any timelapse work we recommend you! It’s amazing what can be achieved with limited funds but lots of commitment, backed with the endless ability of the Studio52’s team. The video captured the event and unique content in style and continues to bring our memories very much alive every time it is watched! Wanted to say thanks for the work on the NPCC Timelapse videos .They were brilliant and we’re very happy with them. Business Bay, Dubai - UAE.